August 7, 2011 - Save the Date!! Today I attended the press conference held at the UTA's TRAX maintenance facility which is the former ZCMI warehouse at 2100 South and 900 East. Not only is the Frontlines program 50% finished, but it was also announced that both the West Valley and Mid Jordan TRAX lines will open on the same day August 7, 2011. I am surprised that UTA would try to open two extensions on the same day. I know of no transit agency that has pulled that off at least in last 30 years (correct me if I am wrong). The day will be a great day in the region for improving our transportation options throughout the area. When you talk about BRT in the United States, Los Angeles and their Metro Rapid program is often brought up as a success story for the operation of BRT. This despite the fact that it is not true BRT and Los Angeles already had examples of BRT: The El Monte Busway, the poor performing Harbor Freeway Transitway, and now the Orange Line. Metro Rapid started with two lines in June of 2000, the 720 and the 750 that traveled along two of LA's busy corridors Wilshire Blvd and Ventura Blvd. Since then 26 other Rapid lines have been implemented that covers most of Metro's operating area. In addition, Santa Monica Municipal bus lines has its own Rapid Line that runs from Santa Monica to the LAX bus station. Just a couple of months ago Metro introduced its most recent rapid line the 733 between Los Angeles and Santa Monica via Venice Blvd and the Venice area. When Metro Rapid started there was promises of special bus stops including next bus indicators but only the first two stops received these special bus stops. In addition Metro only had an agreement with the city of Los Angeles for signal priority, so other routes were still stopped by traffic lights although Metro was working on agreements with other cities. One thing that Metro in Los Angeles did get right is branding. They created a separate brand that differentiated Rapid from other bus routes in the area. In fact Metro created several different brands that each featured its own colors: Orange for every day local routes, Red for Metro Rapid, Blue for express routes (only a couple of these are left), and Silver for Rail services, the Orange Line busway and the new Silver Line connecting the Harbor Freeway and El Monte transitways. Like every other transit system across the nation that depends on sales tax revenue, Los Angeles is facing making cuts to bus service because of declining sales tax revenue. In addition, Los Angeles is also facing cuts from the state as the Govenator continues to raid transit funds to put into his own pet projects and to shore up California's horrible fiscal situation. Therefore Metro is being forced to cut 4% of its bus service. What is interesting is that several Rapid Lines will be among the casualties. Even one of the original Rapid lines the 750 will loose weekend service with the cuts. In addition the areas south of downtown Los Angeles will loose several of their Rapid routes outright. So why, if Metro Rapid is so successful would several routes be on the chopping block? First of all if you look at the Metro Rapid maps you will notice that except for a couple of exceptions, all Metro Rapid routes follow the same route as the local routes. So in other words the Rapid lines did not create any new markets for bus service. Instead of taking a blank slate and saying where would be the most effective markets to create new markets, they either replaced already existing limited stop service or routed the rapid lines down the same streets as the local lines. The one route that truly created new markets plus serving existing markets is the 720. This route overlapped two bus corridors creating new opportunities for riders for a through ride. The other problem with following existing bus service when creating these Metro Rapid routes is that local bus service was cut to provide the Rapid service. This assumes that a majority of the market is looking for the faster ride and the bus stops in between are of no importance. The problem with using is philosophy is not understanding your market. How many of your customers need the local service as opposed to the new Rapid line. The Utah Transit Authority found this out when they implemented their MAX service. UTA severally cut route 35 that parallels the new MAX route down to hourly service during the day. However, after only a short time UTA increased service to every 30-minutes due to demand for the existing 35. In fact Metro in Los Angeles is planning to beef up local service when the rapids are cut. While the Rapid service made since with the length of many Metro routes travel, it is important to determine the market the line is going to go after and not just follow your existing bus routes. When you create a new service clean the slate and look for new markets. Below is the FrontRunner South construction update for September 25 – October 1. Please note that construction information is subject to change. FrontRunner South construction began in 2008 and is more than 50 percent complete. The FrontRunner South line will be complete and operational by 2015. Please visit UTA’s FrontRunner South Webpage to learn more about the project. To view more FrontRunner South construction photos, please visit www.flickr.com/rideuta. UTA would like to remind Utah County express bus riders that service from the 2100 N. Lehi park and ride lot has been discontinued. Express bus service is now available from the Lehi FrontRunner park and ride lot at 2821 W. Executive Parkway, as well as the American Fork FrontRunner park and ride lot at 782 W. 200 S. Because the Lehi park and ride lot will be opened in phases, more stalls are currently available at the American Fork park and ride lot. Street parking is available near the Lehi park and ride lot. Crews will relocate power poles at 1300 South and clear and grub the corridor and continue waterline work between 1700 South and Mill Creek. North of 3900 South crews will be excavating for a retaining wall and south of 3900 South crews will be constructing a wall. At the Central Avenue bridge, crews will pour concrete for the bridge’s back and wing walls and finish shear keys. They will also install signal power service in the area. Between Central Avenue and 4500 South crews will continue track way embankment and at the 4500 South bridge crews will continue retaining wall construction for the bridge’s south abutment and clean up and grade the slopes at the bridge. There will be truck traffic on Central Avenue Monday through Friday. The eastbound right lane will be closed on 4500 South Monday through Friday. Between 4500 South and 4800 South crews will restore street light power and install signal power service. At the 5300 South bridge crews will install deck plates and at Vine Street crews will excavate for a crash wall. Between 5300 South and 5900 South, crews will embank the track way and install storm drain, and between 5900 South and I-215, crews will continue waterline work and also clear and grub the corridor. At the 7200 South bridge, crews will place surcharge. The 4500 South Frontage Road is currently closed at the tracks for bridge work through September. There will be truck traffic at 5900 South all week. Crews continue wall excavation north of 9000 South and soil nail installation south of 9000 South. Crews will be installing fencing on top of the retaining wall between 9120 South and 9400 South and at the 9120 South bridge crews will build forms and pour concrete for the south abutment. At the 10600 South bridge crews will install shoring at the south abutment and continue work on the north abutment walls. Crews will continue mass excavation between South Jordan Gateway and 11400 South and sheet pile shoring installation south of 11400 South. At the Bangerter Highway bridge, crews will continue work on the shear keys. The eastbound right lane will be closed on 9120 South Monday through Thursday. There will be a northbound lane closure on South Jordan Gateway at approximately 10300 South for truck traffic. There will be a full closure of all eastbound lanes on 10600 South between Saturday, October 2 at 10:00 p.m. and Monday, October 4 at 5:00 a.m. There will be truck traffic with flaggers on 14600 South Monday through Friday. Crews will be repairing a wall near 14600 South and continuing canal realignment work south of 14600 South. Now that Union Pacific traffic has been shifted onto the new bridge constructed at the Jordan River, crews are retrofitting the old UP bridge for UTA’s use. This week, crews will place girders and build deck forms. Crews will be installing permanent fencing north of Thanksgiving Point and along the Golf Course. Crews are currently constructing two major bridges in Lehi at 2300 West and 2100 North. The 2300 West bridge will allow FrontRunner to travel over Lehi City’s future 2300 West road project and the 2100 North bridge will span UDOT’s future Mountain View Corridor, 2100 North roadway. The 2100 North bridge will feature abutments on each end of the bridge and five center piers. In the Cranberry Farms area, crews will be working on a retaining wall at approximately 2400 North, staging ties and distributing rail and installing duct for fiber at the 2300 West and 2100 North bridges. Crews will also install deck plates at the 2300 West bridge and grout and patch and install bolsters at the 2100 North bridge. Between 2100 North and 1500 North crews will stage ties and distribute rail, and between 1220 North and 900 North crews will clear and grub the corridor, build slopes and ditches, prepare the sub grade and install signal power. Crews will construct crossing upgrades this week at the Main Street crossing in downtown Lehi. This work will include signal and track work, the installation of concrete medians and signs, road striping, and asphalt replacement. Crews will be working 24 hours a day at this crossing in order to reopen it as soon as possible to the travelling public. On Center Street, crews will be installing concrete medians near the crossing, and southeast of 300 East in Lehi, crews will finish prepping the sub grade prep and place sub ballast. There will be truck traffic on 500 West in Lehi near the tracks all week. The Main Street crossing in Lehi will be closed for crossing upgrade work Monday, September 27 through Sunday, October 3. Traffic will be detoured on 300 West, 500 North and 500 West. There will be lane restrictions on Center Street in Lehi on Monday. At the pedestrian tunnel, crews will continue work on the tunnel floor and will also trench for a drain connection. At the Park and Ride Lot, crews continue preparing a new section of the parking lot for paving. Crews will be installing fiber between 7350 West in American Fork and University Parkway in Orem. In American Fork, crews will continue work to relocate a power pole and phone pedestal at 1500 South. Between 400 North in Vineyard and Geneva Road in Orem, crews will install permanent fencing. There will be lane restrictions on 1500 South in American Fork Monday through Wednesday. 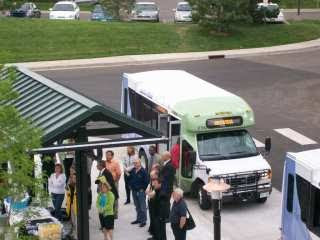 A portion of the American Fork Station Park and Ride Lot is now open for public use. Crews will surface, line and dress the track between University Parkway in Orem and 2000 North in Provo and install fiber between University Parkway and 1680 North. North of 820 North in Provo, crews will be re-grading ditches, and between 700 West and 900 South crews will de-stress track and remove poles. Crews will install vapor barrier and tie rebar for the low deck at the Provo Station. * Traffic on 7800 South in West Jordan will be subject to lane shifts continuing through early October. 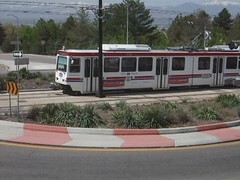 The Mid-Jordan TRAX line is a 10.6 mile light rail line that will connect the communities of Murray, Midvale, West Jordan and South Jordan with the existing Sandy/Salt Lake TRAX line. It runs from the existing TRAX line at 6400 South to approximately 7400 South, then turns west along the Bingham Branch of the Union Pacific Railroad. At 5600 West, the line turns south again and ends at the southern end of the Daybreak development. For construction purposes, the line has been segmented into five sections. New vehicle testing is ongoing in Daybreak. Crews continue installing canopy components including bench brackets and side slats. Crews will also be cleaning up at the 5600 West park & ride. Miscellaneous track work continues in this segment. Crews will be striping the 4800 West park & ride. Work moves forward for the entrance to the West Jordan City Center park & ride. Light pole foundations are being poured. Track and overhead catenary system (OCS) work continues in this segment. Canopies are scheduled to be erected at the Bingham Junction station, and ADA ramps are scheduled to be poured as well. Landscaping continues at the Historic Gardner park & ride. TRAFFIC IMPACT: 7800 South will have lane shifts in place through early October. Grading crews continue working at the Fashion Place park & ride, and curb, gutter and sidewalks are being constructed. The canopies are scheduled to be painted, and the dirt parking lot south of the Y tracks is scheduled for grading prior to being paved in early October. OCS and electrical work continues. A description of what is happening in each area is listed below. Text marked in red indicates new work items. If you need further construction information, please call our toll-free 24-hour hotline at (888) 800-8854. Crews are working to restore 3700 West to two traffic lanes before the season changes. Work on the Rocky Mountain Power fiber infrastructure continues. Internal airport traffic restrictions will be in place. Crews continue work on the 24’’ sewer installation. This work is taking place within internal airport lots. Crews are working the 18’’ storm drain near the Terminal One Welcome Center. Work continues along 3700 West as crews form and pour pedestrian ramps and form, pour and strip ballast curb. Crews will begin working on an 18” storm drain near the United States Post Office. Pedestrian traffic has been switched to the east side of 3700 West. Crews are repairing sewer sags along 3700 West. Crews are relocating the UDOT solar sign in this area. Work continues on v ditches and cast in place walls. Storm drain work is taking place. Crews are forming and pouring a concrete line ditch. Cast in place wall work is scheduled to begin again. Production welding will begin at the end of October. Crews will weld 80’ strands of rail into a continuous 1200’ strand of rail at that time. · Ductbank and OCS work begins in the coming weeks at X Bar to 2400 West. Demolition of the slope paving is scheduled to begin next week at I-215. Reach Description: Reach 4 extends from I-215 to just east of Redwood Road on North Temple. TRAX will be center running and will include a station located at approximately 1950 West. Access to businesses and governmental organizations will be maintained. Traffic signal work, including conduits, pedestals and junction boxes, is taking place at 1950 West and North Temple. Work is taking place on the joint trench crossing at three different locations, with one crossing located at Orange Street and North Temple. Various lane restrictions are in place; however, access is being maintained. Crews are installing an 8’’ storm drain to address back of walk drainage issues. Work is taking place on the southeast, northwest, and northeast corners of Redwood Road and North Temple as crews work on a storm drain. Traffic impacts are expected to be minimal during this phase of work. Waterlines will be relocated for meters and hydrants and will require Sunday, Monday, and Tuesday nighttime service disruptions. We will be meeting with businesses prior to this work. Crews are removing and replacing curb, gutter, sidewalk and driveways on the north and south sides of North Temple between Redwood Road and I-215. Duder Street will close on Monday, Sept. 27, as crews demo and restore the entrance off of North Temple. This portion of work will be completed in less than one week. We will meet with businesses prior to construction. Crews are scheduled to begin sewer sag repairs at Orange Street and North Temple in mid-November. At this time, various lane restrictions will be in place; however, access to businesses will be maintained and signage will be provided. In preparation, various activities are taking place near Orange Street. As we get closer to construction we will meet with businesses in this area. Traffic Impacts: There are right and left lane restrictions between the I-215 overpass and Redwood Road throughout the day. As work progresses, there will be additional lane restrictions for both east and west bound traffic. Access will be maintained at all times. Reach Description: Reach 5 extends from just east of Redwood Road on North Temple to the Jordan River. TRAX will be center running and includes a station at 1500 West. Access to businesses and office complexes will be maintained. Crews are relocating gas lines with new casings. In the coming weeks, various pieces of wet and dry utility work will filter into this area. One lane of traffic is restricted. Storm drain work is taking place in this reach. City Creek work is scheduled to begin to complete structures and paving. Traffic Impacts: After the State Fair, traffic will be limited to one lane in each direction. The North Temple Viaduct re-construction project began April 18 and will last for approximately 18 months. Wet and dry utility relocations are currently taking place at 400 West to prepare for the City Creek East relocation. Work continues on abutments, pier caps, and fascia walls and work is ahead of schedule. In early October, crews will be on 400 West with the City Creek East work. Significant traffic impacts will be in place along 400 West. Please see the viaduct construction guide below to find out how to get around during construction. noon to 5 p.m. on Sunday. usual. They invite you in for some pampering of your own. Progress continues on the construction of the West Valley TRAX Line. To keep business and traffic impacts to a minimum, this five-mile project has been separated into seven construction “reaches,” or segments, for management and planning purposes. · Work continues on the station canopy at West Valley City Hall as crews install wiring, lighting and masonry. · The West Valley City Hall parking lot on Market Street will close on Friday, Sept. 24, as crews make asphalt repairs in this area. · Crews will also repair asphalt at the Toys R Us loading dock off of Market Street on Tuesday, Sept. 28. Reach Description: Reach 2 is the area along 3100 South from Constitution Boulevard to Decker Lake Drive. The Maverik Center and a few other businesses are located in this reach, as well as residents on either side of 3100 South. We will coordinate our work to maintain access throughout construction, and in particular to the Maverik Center during their events. When TRAX is completed along 3100 South, it will operate on the south side of the roadway. · Curb and sidewalk work, along with various punch list items, continue in this area. · Crews are distributing rail, ties and ballast in the center of Research Way. · Work continues on the station in the center of Research Way just west of Redwood Road. · Significant work has been accomplished in the Chesterfield area. Crews continue to work on various items throughout this reach. · Crews will stripe the roadway on 1070 West and begin street sign installation this week. · Crews will continue rail and station work in the center of 1070 West. · Progress continues on the TRAX bridge structures over 900 West at approximately 2200 South, as well as the Union Pacific Railroad Roper Yard area. · Track work continues along Andy Avenue near 300 West in South Salt Lake City. I have seen comments in the past that we need a bus station in downtown Salt Lake City. We already have Central Station but is located on the far west side of downtown and for people transferring between routes is out of the way. In addition the station is not truly a central station but nothing more than a glorified TRAX/Front Runner station with a Greyhound component. Hopefully the station will become a true central station over time but we shall see. While at first thought a bus station in the downtown area would seem like a good idea considering the number of bus routes in the downtown area, the success of such bus stations in other cities have been mixed at best. For many years the RTD (now MTA) in Los Angeles maintained a large bus station in downtown Los Angeles that was shared with Greyhound. The station was built on what was the approach tracks for the Pacific Electric and their grand Main Street Station. By the 1980's because of cost and the general decline of the neighborhood RTD stopped using the station and it was eventually abandoned by Greyhound. Spokane, Washington is probably a good example of trying to build something in order to solve a problem that only created more problems. Until their new bus station was built all the bus routes in the downtown area would converge at the intersection of Riverside and Howard. Area businesses complained about the "wall of buses" that would block their streets and bring too many undesirables to the area so it was decided to replace the wall with a bus station (a historic irony is that most of the businesses that complained so much went out of business within a few years after the buses moved a block away to the new transit station). The bus station was originally designed to be the lobby of a high rise that was to be built above the station however the high rise project was stopped by Spokane's decades long lack of an economy and by CAVE people who didn't like the idea of public-private partnerships (the Spokane area has a big block of CAVE people - Citizens Against Virtually Everything-or in Spokane's case are against everything). In addition instead of having the bus station become part of the street life in the area, it was instead design to flow people into the skywalk system. However, by the time the transit station was completed the skywalk system was on life support and there was attempts to bring life by to the sidewalks in the area. While there is still some retail and some fast food restaurants to access across the street via the skywalk, the lack of good pedestrian flow to the street side has been a major issue for the bus station. In addition the bus station is often criticized for having too many young people around and scaring off the normals. Compare that to Denver who has not one but two bus stations located in the downtown core. The difference in Denver is that local bus routes still serve the surface streets with express and regional service routed through the bus stations. 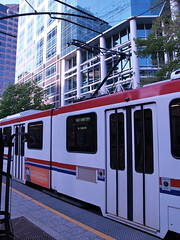 Denver's stations are also located underground and where more successful with selling the air rights above the stations. Both stations are connected by Denver's free 16th Street Mall shuttle buses that make frequent trips between the two stations. Denver is now in the process of replacing the smaller of the two stations with a new larger bus station as part of their Union Station redevelopment project. The bus station will still be underground but will also be a connection from the new light rail station to Union Station which will not only be serving Amtrak but also Denver's new commuter trains that will be running in the next few years. Another problem that can crop up with downtown bus stations is the value of the property they sit on. In one smaller east coast city, property values and development started hopping in the downtown area so city officials wanted rid of the transit center so the property could be developed into more "useful" purposes. The bus station was not seen as an asset, or part of the downtown area, it was seen as a nuisance taking up valuable land resources. Looking at the Salt Lake situation, the question is, where would you put the station in order for it to be convenient to a majority of the downtown users, convenient for all the bus lines to get to, and would have enough area for operations? An ideal situation would have been to integrate it into the design of City Creek Center, although the developers of that project may have seen bus riders as undesirable in their new complex. Most of the other areas would be on the west side of downtown which would place it too close to the already existing Central Station. The best current solution for Salt Lake City would be to put in dedicated bus lanes to improve bus flow and make bus waiting areas as welcoming as possible. This will do more for transit ridership and the riders than building a duplicate transit center. -What will be the long term cost of operations and can the transit system afford it on the long term? -Will the station be designed to flow into the surrounding area or be cut off from the street? -How will you deal with the perception that too many of a certain type of people hang out at the transit station (whether it be homeless, teenagers, or some other group that others consider undesirable). -Will air rights above the station be sold and if there is a desire for that will public opinion and the area's economics allow it? -If real estate starts to boom, will your property be protected from having a hostile city council from keeping the transit center off the land to sell it to a developer? The number one reason to build a transit center/bus station in a downtown area should be to provide the best possible service to customers, not as a redevelopment solution or a way to move buses somewhere else. Build a transit center for the wrong reasons is only asking from it to fail in the long run. While using an existing rail line for light rail service makes since in many respects, one of the downfalls including the North-South TRAX line is that it has a hard time serving major employment and entertainment spots that were designed around the automobile. As Transit Oriented Development becomes more common in the area that will be less of an issue but until then we have to deal with existing development and working around it. Sandy is a perfect example of the problem. While the 9400 south station directly serves Jordan Commons, other major spots are not close to the TRAX stations. While this would not be a problem in a pedestrian friendly area, I am sure there is no one who would describe the area between the Sandy Center station and the South Towne Mall as being the least be pedestrian friendly, in fact it is very hostile to the pedestrian. Even mainline bus service has a difficult time serving some of these destinations. After all, you get off the bus and many times you are faced with crossing a huge swath of concrete with cars speeding through it and their drivers not paying attention to anything except to save two seconds. The other solution would be to provide shuttle services from these stations to the major points in the Sandy Area. Route A: From the Sandy Civic Center TRAX station via Sego Lily/10000 South, travel north on 300 West to the SLCC campus then return to 10000 South, then via Jordan Gateway, 10600 South and South Riverfront Parkway through the major office complex there. This route probably could run rush hours only but by adding a couple of destinations could become a full time route. Route B: This route would travel from the Sandy Civic Center TRAX station via Sego Lily, 700 East and 9400 South to Alta View Hospital. After making a loop through the hospital travel 1300 East and 9400 South to the Gravel Pit shopping center. Then via 9000 South, 300 West, 9400 South, State Street, South Town Ridge, Monroe/240 West, 10000 South and 300 West to the SLCC campus. Then via 300 West, 10000 South and 240 West/Centennial before making a loop around the South Towne Mall and then returning to the TRAX station via 200 West/Centennial and 10000 South. Optimally you would want to run route B as a bidirectional loop meaning that buses would run both directions around the loop to maximize ridership potential. I designed the routes to service the maximum number of important spots as with routes that would see the fewest problems with traffic congestion. The next question is the most important that who would pay for this? Right now it is not economically feasible for UTA to pay for this kind of service unless it is able to get a grant to provide the service on an extended basis. Ideally the city of Sandy should be responsible for providing this service and could contract with either UTA or another agency to provide the service (so long as transfer agreements are made with UTA if fares are going to be charged-unless its something small like a quarter). After all the city of Sandy would see the benefits of this service from providing another way to get more shoppers into the area to providing an alterntative to driving for more people especially considering how congested areas such as 9000 South and 10600 South are. If, and I do mean if, the city of Sandy would really want this kind of service to be a success, they could work with merchants and employers to market the service and encourage ridership. Sandy could do specific branding of the buses making it part of the marketing program which could even include businesses sponsoring a bus like local businesses in Portland sponsor the streetcars in that city. Of course then Sandy could go really overboard and buy those buses meant to look like old time streetcars but truly are nothing but a bus with uncomfortable seats. One of the difficult aspects of getting people on transit is getting them to major employment, entertainment, and shopping destinations in a auto centric environment. In the long term land use plans should focus on transit lines but until then we need creative ideas to get people to major destinations. One of the problems we face here in Utah is the lack of regional planning. While we do have the Wasatch Front Regional Council and MAG, they concentrate primarily on highways and the cities still do their own planning. Of course the likely hood of having an effect regional planning organization in Utah is nil considering the political bent of many in the region. However, I decided to do a what if scenerio. What if we could take a bus route, look at all aspects of that bus route including land use and direct land use and transit planning to improve the route and the neighborhoods it travels through. 1. Had to be a frequent service route to provide enough service to be attractive to choice riders. 2. To create better dynamics, the route had to connect with as many other frequent service routes as possible (which eliminated routes such as 35 MAX/35). 3. The route had to have either vacant land or an area in decline in order to optimize the redevelopment opportunities to create transit friendly development. 2. 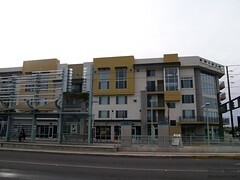 The route not only has a large number of connects in downtown but it also connects with many frequent service lines along its route including TRAX, 21, 33, 39 and 45. 3. The area between 2100 South and 4500 south has areas that are in decline and and have opportunities for redevelopment into more pedestrian, transit, and bike friendly neighborhoods. So lets start off with the basics and look at the route itself. The route travels from downtown to the Fashion Place West TRAX station via South Temple, 900 East and Winchester. As I have mentioned many times before, it makes more since to improve bus routes such as the 209 than to do Badly Repackaged Transit which is not just like rail except cheaper which it is not. Signal Prioritization would be a good step to improve performance but like planning with each jurisdiction having control over their traffic lights, it makes doing it difficult. While the MTA in Los Angeles has been successful with signal prioritization in the city of LA, there is many small cities that Metro Rapid lines pass through that have not implemented them slowing the routes done. Next up would be to consolidate bus stops that are located too close together and design the remaining bus stops to take advantage of low floor buses by making the curbs equal to the stop on the buses. This along with doing away with the fare free zone allowing buses to board from the front door in both directions will allow the bus to make the trip faster. A longer term goal would be to change the south end of the line. Instead of traveling on Winchester, the buses should continue south along 900 East. The current portion along Winchester should be replaced by an extension of route 62 from the Fashion Place West TRAX station to the Cottonwood Corporate center and on to the park n' ride lot on Wasatch. This would be a long range goal that is not going happen in the near term. The 209 should be split into two routes the 208 and the 209 with the 208 traveling 900 East/700 East to 8000 South to State Street to 7720 South and over to the Midvale Center TRAX station. The 209 would turn southeast along South Union and Creek Road like the old 44 then continue on to 3500 South and Bengal Blvd. The only issue would be the snobby NIMBY's along the eastern side of Creek Road would probably oppose having a bus in their neighborhood. Of course these ideas are years away as we have to build ridership on the existing system to make them economically feasible. The last bus related improvement along the route would be to add bus stop shelters at major stops along the route. However, they need to be designed to fit into the neighborhood and not be the standard ugly glass and metal shelters many transit systems use. The next step would be redevelopment of several areas along the route that will increase density in important spots which will also increase ridership not only for the 209 but the other frequent service lines that cross the 209. First up is the intersection of 400 South and 900 East where the University Line TRAX station is located. All four corners of this intersection could be redeveloped with community stores and housing above. The housing could be tailored to the older students at the U or to downtown workers. Next up would be the Sugarhouse area. Right now the corners at 2100 South are dominated by auto designed stores especially the new Kroger store on the southeast corner (yes I know it says Smith's, but Smith's largely exists in name only it is a Kroger store). There is plenty of possibilities to create a pedestrian, and bike friendly corridor from 2100 South down to I-80 where the new recreational trail will go through. This should be part of the Sugarhouse plan that includes the streetcar connections once it is built. The intersections of 3300 South, 3900 South and 4500 South are also ripe for redevelopment that should include transit, pedestrian and bike friendly uses that include apartments, homes, and neighborhood retail. The neighborhoods between the intersections would largely remain untouched and still have better bus service. The biggest obstacle in this part of the corridor would be the Kroger store at 4500 South and 900 East since Kroger has shown to be very anti-pedestrian friendly. They want to the store this way or the highway and are willing to blackmail with the threat of leaving the area to get their way. To top it all off, the center is owned by the Boyer Group which has not shown any friendliness to transit friendly designs. By making improvements to the bus route and redeveloping under performing real estate you will not only create a better bus line, you will improving the community and building a better base for ridership on UTA lines. You will also create more vibrant community that will be a discouragement to the gangs that seem to be taking over that section of the community. After a slow August in the world of passenger rail, we return to a busy soon-to-be autumn. Union Pacific has told Amtrak that changing the Sunset Limited‘s frequency from tri-weekly to daily will cost the government-supported company about $750 million in capital improvements. That’s almost as much as Phoenix spent building an entirely new 20-mile “light rail” system — including two large bridges and a complete modern maintenance facility and fifty computer-controlled trolley cars. We eagerly await U.P.’s wish-list. One wonders, once you spend some millions to restore a missing connection at San Antonio to eliminate back-up moves, add a couple formerly removed station tracks at places like Tucson, add a bridge here and some signals there … how do you come up with three-quarters of a billion dollars to run one train once a day? Meanwhile, Berkshire’s BNSF issued a two-part $750 million bond, $250 million for a 10-year period at 3.616% and a 30-year $500 million part at 5.074%, both paying a premium over Treasury bonds. In his annual letter to shareholders, Berkshire chief Warren Buffett wrote: “Overall, we expect this regulated sector to deliver significantly increased earnings over time, albeit at the cost of our investing many tens — yes, tens — of billions of dollars of incremental equity capital…” So the same dollar figure that U.P. wants for one passenger train, it seems, is the same as BNSF’s first installment in sprucing up its entire system. Does one of those numbers seem a bit off? Yet we rail advocates find ourselves in a nasty predicament. Every time good work gets done, as in Ohio, toward a new train… or in Boise… or anywhere across the country where cities and states who want better transportation, and the social and economic benefits that stem from trains… Every time new Amtrak service is proposed, the price is so high and the service to be so slim that nothing ever happens. A year ago we looked at Amtrak’s Ohio report, one of three wrong-think reports issued around that time. We saw how “Amtrak really doesn’t want to be in the passenger railroad business” and, although there were some hopeful signs in subsequent months, we seem still stuck in the same doldrums as for the past 40 years. Amtrak’s complaints are so ingrained in politicians’ and voters’ minds that when some good public relations is needed, the cupboard is not only bare, but snarling back at those seeking relief. has spent most of the last forty years not only saying, but proving, that passenger rail is a fiscal sinkhole. Needless to say the green eye-shade brigade in state capitals that must produce a balanced state budget every year takes on massive new obligations only with trepidation. Add to this carriers like Union Pacific pulling massive numbers, some might think out of a hat, but perhaps out of reasonable expectations based on past dismal performance of a government-run passenger railroad, and here we sit, stalled again. Perhaps the most excellent description of the conundrum is Steve Forbes’ recent commentary on high-speed rail. Forbes, logically unconvinced by what trains might be able to do, looks at projects like the Acela so-called high speed train which have failed to deliver on practically any of their promises, and at the cost of billions including a hidden billion-dollar loan from Canada… and rightly asks, Where is the benefit? Forbes doesn’t see any. And without benefit, what is the point of pouring billions more dollars into it? At some point, there have to be results. Call it return on investment. To succeed in business, to succeed in the real world, you have to become indispensable. Apple has done that. Google has done that. Some might say Amtrak seems to have concentrated on becoming irrelevant. Denver joins a growing list of U.S. airports that are trying to promote public rail transportation. Others that will be connected directly via rail in the coming years include Dallas Love Field, Salt Lake City, Phoenix, Miami, Dallas/Fort Worth, Oakland, Washington Dulles and Los Angeles. “It will not be possible to accommodate growth and avoid traffic congestion by improving roadways alone, so passenger rail should become a key component of the Sun Corridor transportation system,” the draft plan stated, referring to a planning area that stretches from Prescott on the north to Nogales on the south and includes both Phoenix and Tucson. Phoenix is seeing results with its Metro trains, with monthly averages up to 44,000 daily riders, far above the projected 26,500, and continuing year-over-year increases. With few exceptions, every city that has built a rail system in the past decades has met or exceeded expectations, and brought new development and a renewed sense of place and community pride. The cost has shown its benefit. Why should there be any different standard for intercity trains? Finally, as promised, this on first-class accomodations. Andrew C. Selden: The issue is the corrupt Amtrak RPS-based internal MIS/cost accounting system. Large subsidies to western sleepers are an artifact, if not an intentional distortion, caused by the system, not the business activity. We can show (and have often done so) that these sleepers are substantial net contributors of free cash flow to Amtrak, failing only to cover arbitrarily allocated shares of other system, not operating, costs, only some of which are even indirectly related to the operation of these services. 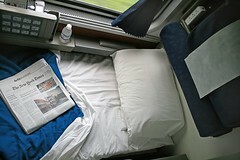 The Superliner sleeping car, measured by business economic factors like return on capital investment, load factor, revenue per dollar invested, etc., is the best thing Amtrak owns. These members of Congress should look closely at actual sleeping car fares out west, where many passengers are paying thousands of dollars for a single trip. There is NO POSSIBILITY that these fares are losing money on a direct cost basis. The catch is always to audit deeply what costs Amtrak is charging against the sleeping car revenues to determine that a loss exists in the first place. That is where the members of Congress were being conned. The collateral issue is the subsidy that these sleepers provide to the dining cars. FIRST, diners are indispensable to all travelers on LD trains, where the AVERAGE trip runs 15-20 hours in duration (varying by route). These people therefore (including every coach passenger) are on board over two to four meal periods (and of course some for even more). Lose the diner, and you’ll lose ALL the passengers, not just the “fat cat” families and retirees in the sleepers. The sleeper fare transfer to the diner is what keeps the diner on at all—by including meals in the sleeper fare, Amtrak guarantees a predictable base of revenue to the diner. Take away the sleepers and that fare transfer, and with the loss of sleeping car passengers (most of whom wouldn’t be caught dead making a two or three day trip in coach) and their fare transfers to the diner, the diner would have to charge obscene prices that would drive out the remaining coach passengers, and without meals over two to three day trips, no one will ride and the trains would be empty. If Congress wants to look for subsidies to first class riders, have them divide the Acela first class revenue by its proportionate share of the annual two-thirds of a billion dollars of subsidy “invested” each year into the NEC. Those numbers are real and staggering, even though Amtrak never reports them as such. Randy Schlotthauer: Were it not for the frightening lack of concern by our government about the concerns of citizens, not to mention their misplacing of the Constitution (I have several copies of my own that I would be happy to donate to them), this entire debate over “first class” subsidies would be so tiresome that I would not be drawn to the laptop to respond to it. Those of us that have been involved with Amtrak since THE BEGINNING (that would be before many supporters and opponents were born) have seen this windmill tilted at every year. I remember when we were desperately phoning and writing politicians, interest groups, and anybody else that would listen over a $246M TOTAL SUBSIDY that promised that the pin would be pulled on October 1, (fill in the year). This was in the good old days when there were just two types of cars: Amfleet and everything else, which wasn’t much. Though few of us at the time would have granted it, Amtrak President Graham Claytor managed to “modernize” the fleet with new equipment which in retrospect probably saved the LD trains, which we were convinced he was conspiring with THEM to eliminate. Though designed with the promise and physical capability to deliver a high quality LD experience, through active sabotage by some crew members and a benign neglect (read: stupidity) on the part of management. None of the LD trains ever made full use of the features designed into the cars, and did not repair equipment that was damaged or stolen by passengers, crew, and the denizens of 16th St, 8th Street, and other “maintenance facilities”. As a result, even the best attempts by individual route managers to ended up flowering and then all too soon downgraded due to budget cuts that often were the disguised jealousies of other route managers. Despite the efforts of the original RailPAC-URPA group to introduce market economic laws and theories to Amtrak and it’s 485 owners, every year it was a battle for survival, with Amtrak management’s RPS accounting system proving that they could be profitable if not for those nasty LD trains. Never was enough capacity provided to even approach break even, which was all any serious advocate discussed. If every seat in every car on every train on every day were filled at the highest tariff fare, there would still be a loss. Even Herb Kelleher (Southwest Airlines) couldn’t do anything with one triweekly plane to its largest potential markets. He recognized that planes (and trains too!) make money only if they are moving and filled with people. In fact Herb was one of Amtrak’s greatest opponents, because he knew what a well run passenger railroad could do. So today we are discussing the proposed elimination of the First Class Subsidy, in order to “save” the railroad. First of all, the last trip I took in a Deluxe Bedroom on #3 and #4 could not be called luxury by any stretch of the imagination. Indeed, Denny’s offers superior food, service, and even entertainment (if you are at the right one at the right time of night). When you kill the sleepers you kill the diner and lounge. When you kill those, you are the Southern Pacific in the 1960′s, although this time there are not enough people that buy the line that America NEEDS Amtrak. I can build you a great case for a quality passenger rail service, including multiple classes of service. I can even build you a case of how you make it break even in 10 years. RailPAC-URPA’s Dr. Adrian Herzog did the math a long time ago, and it still works. What I cannot do is build a case to justify an Amtrak First Class Subsidy for LD trains. There is corporate culture at Amtrak that would fight any attempts to a really make things work. New York to Study Red Hook Streetcars, But What Are the City’s Goals? I was planning on doing a response to the Jacksonville entry but now the Transport Politic lets me add even more comments to the fire. First of all, most people know that I believe in streetcars in providing effective Urban Transport. However as I was going to point out and Yonah has done in his blog entry, historic streetcars may not be the best way to go for most cities. 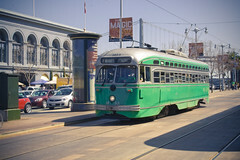 While San Francisco has been extremely successful in not only operating a line of historic streetcars, it is best known for its legendary cable cars that still ply the rails of the city. However, San Francisco is unique in the aspect that its transportation system is also a tourist mecca. While other cities such as Fort Collins, CO and Tucson, AZ among others have historic streetcars running down their streets, San Francisco is the only city I can think of that many people travel to ride historic transit vehicles. Other cities need to decide what their goals are. Are they trying to provide a modern form of urban transport or are they trying to build a tourist attraction that will not be part of the transit network. Trying to be both is difficult at best. If the goal is to provide modern urban transport, then you need to design it for those purposes. On the other hand if your goal is to develop a tourist attraction, then it should be totally separate from your transit system so that its success or failure will not affect the important operation of your other transit operations. Philadelphia has used old PCC cars brought up to modern standards with wheelchair lifts and air conditioning but still have the limits of using rolling stock designed for another generation. Philadelphia did this more to save money over buying new rolling stock but in the long run buying modern equipment may have been the more prudent financial decision. One thing I will disagree with Yonah about is why streetcars disappeared in the 1930's. He makes the case that buses were more modern than old streetcars and while that may have been true for some, it also fails to point out that streetcar systems were also heavily taxed. In fact many streetcar lines were still making a profit but the taxes they were having to pay not only would not allow them to upgrade their tracks, but it put them badly in the red. To top it all off, many of their tax dollars were used to fund local roads which was their main competition. Of course is this any different than how many cities used the tax dollars from small businesses to pay for IKEA's, Cabella's, and Wal-Marts who in turn put small companies out of business. Come Join us at the State Fair! Our construction team for the Airport TRAX Line has partnered with UTA and local businesses to host a booth today through Sunday. We will be on hand to answer questions about construction and upcoming events. Look for us near the rodeo grounds – and don’t forget to take out your frustrations at the dunking booth. Construction continues on UTA’s Airport TRAX Line. To keep business and traffic impacts to a minimum, this six-mile project has been separated into seven construction “reaches,” or segments, for management and planning purposes. The map below shows each construction reach in a different color, starting with Reach 1 in dark red by the airport and ending with Reach 7 in light green on the east end of the project. Crews are excavating the east side of 3700 West from 510 North to Gate 13. During this time, lane restrictions will be in place; however, access will be maintained. Driveway and sidewalk reconstruction is also taking place. Crews are working the 18’’ storm drain near Terminal 1/Welcome Center. Work continues on wet and dry utilities along 3700 West. Fiber vaults and street lighting are being installed. Various traffic restrictions are in place for internal airport traffic; however, access is being maintained. Work continues on cast in place walls (CIP) and excavation of the guideway between the X Bar Bridge and 3700 West. Beginning Sept. 13 pedestrian traffic will be switched to the east side of 3700 West. Crews are working on the pedestrian path near Surplus North. Early next week crews will begin work on a 20’’ waterline. Crews are working at the North Temple intersections located at 2200 West and 2400 West. Traffic signal cabinets are also being installed at these intersections. Crews have removed a portion of the island between North Temple and Old North Temple, and restoration is in process. Lane restrictions are in place; however, access is maintained. Work is taking place on the joint trench crossing at three different locations. One crossing is located at Orange Street and North Temple. Various lane restrictions are in place; however, access to businesses is being maintained. Work is taking place on the southeast corner of Redwood Road and North Temple as crews work on a storm drain. Traffic impacts are expected to be minimal during this phase of work. Crews are scheduled to begin sewer sag repairs at Orange Street and North Temple in mid-October. At this time, various lane restrictions will be in place; however, access to businesses will be maintained and signage will be provided. In preparation for this work, various activities are taking place near Orange Street. As we get closer to construction we will meet with businesses in this area. Work on the Redwood Road intersection has been postponed due to Right of Way (ROW) issues. Preliminary activities will take place but major reconstruction will not occur until spring of 2011. We will meet with businesses prior to construction. Crews continue to relocate hydrants and water services in the coming weeks. We will continue to meet with the businesses and coordinate any planned interruptions to services. The Jordan River Bridge is reopened as the Utah State Fair begins this week. Crews are relocating gas lines in this area. Work continues on Garside Avenue as crews demo, grade, and pour the driveway near the KOA property. There is occasional potholing for dry utilities taking place ahead of construction. After the State Fair, additional crews will begin wet and dry utility work. Traffic will be limited to one lane in each direction in some parts of this area. Crews are removing and replacing City Creek West between the Jordan River Bridge and 1000 West, although the road will be opened up during the State Fair Sept. 9-19. Wet and dry utility relocations are taking place at 400 West to prepare for the City Creek East relocation. Work is taking place at the Boyer (South Temple) parking lot. Clear and grub activities continue and crews are working on grade, placing sidewalk, and installing lighting conduits. Crews have begun working on an 18’’ storm drain near 600 West and 100 South. Various lane restrictions are in place; however, access will be maintained at all times. Crews have completed drilling 16 of the 16 shafts for the new North Temple Viaduct. Work continues on abutments, pier caps, and fascia walls. · Saturday, Sept. 18, beginning at 11:30 p.m. until Monday, Sept. 20, at 7 a.m.
people looking for a place to park. attention every year for more than 100 years. Below is the FrontRunner South construction update for September 11 - 17. Please note that construction information is subject to change. Crews will continue installing a waterline between 1700 South and Mill Creek and permanent fencing from Mill Creek to 3300 South. At the Central Avenue bridge, crews will install a sewer line casing and build forms and pour concrete for the bridge abutment footings. Crews will continue to embank the track way from Central Avenue to 4500 South, and at the 4500 South bridge, crews will build forms and pour concrete for the back wall and also work on a retaining wall for the bridge’s south abutment. There will be truck traffic on Central Avenue. A house will be demolished near the 4500 South Frontage Road to make room for a future road realignment of 200 West. At the 5300 South bridge, crews will continue work on the shear keys, and between 5300 South and 5900 South, crews will continue installing concrete pipe and fencing and demolishing track. They will also remove trees and embank the track way. Between 5900 South and I-215, crews will continue waterline work, and at the 7200 South bridge, crews will place surcharge. The 4500 South Frontage Road is currently closed at the tracks for bridge work through September 20. There will be truck traffic with flaggers on 5900 South. · Full road closure, Friday night, September 17, 10 p.m. – 5 a.m.
· Double left lane closure, Saturday night, September 18, 10 p.m. – 5 a.m.
At the Murray Station crews will install conduits and backfill drains. North of 9000 South, crews continue excavation, shoring and lagging installation, and at the 9000 South bridge, crews will pour a leveling pad for and backfill at the north abutment. South of 9120 South, crews will be drilling soil nails and continuing wall construction, and at the flyover bridge crews will be installing permanent fencing. At 10000 South, crews will set a transformer vault and proof power conduits. At the 10600 South bridge, crews will continue pier work and also install abutment shoring, and between South Jordan Gateway and 11400 South, crews will be excavating in the corridor. Work on a sheet pile shoring wall will begin this week south of 11400 South and at the Bangerter Highway bridge, crews will continue work on the shear keys. Track way embankment will continue between Bangerter Highway and 14600 South. There will be truck traffic with flaggers on 9400 South. There will be a lane drop for truck traffic on South Jordan Gateway at approximately 10400 South. · Eastbound left lane closure, Monday through Thursday, 10 a.m. – 2 p.m.
· Eastbound double left lane closure, Monday night, 10 p.m. – 5:00 a.m.
· Westbound left lane closure, Monday night, 10 p.m. – 5 a.m.
· Westbound left lane closure, Tuesday, 10 a.m. – 2 p.m. The westbound right lane will be closed on Bangerter Highway on Thursday. There will be truck traffic on 14600 South. Canal realignment work will begin south of 14600 South and crews will also continue waterline work near Camp Williams. Now that Union Pacific traffic has been shifted onto the new bridge constructed at the Jordan River, crews are retrofitting the old UP bridge for UTA’s use. This week they will continue forming and pouring wing and back walls. In an effort to increase safety for area schoolchildren, the project will be installing a stop sign at the entrance to the 2300 West bridge construction work site at the 2300 West/2150 North intersection in Cranberry Farms. Crews will also be refreshing the paint on the crosswalk located at the entrance to the work site. All trucks leaving the bridge construction site will come to a complete stop at this crosswalk before proceeding through the intersection. Between Club House Drive and 2100 North, crews will be cleaning up slopes and ditches along the corridor and prepping the sub grade. At the 2300 West bridge, crews will grout and patch and at the 2100 North bridge, work continues on parapet walls. Retaining wall work also continues in Cranberry Farms near the 2300 West bridge. Work will resume on the retaining wall south of 900 North, and, crews will continue to support work for Union Pacific duct and fiber installation at 500 West, Main Street and 200 South in Lehi. Crossing work will take place at 100 North near the Lehi Rodeo Grounds and will finish up this week at the 200 South crossing. Crews will continue permanent fencing installation between 300 South and 200 South and cross drain and catch basin work between 300 East in Lehi and Main Street in American Fork. There will be truck traffic at the 2300 West 2150 North intersection in Cranberry Farms. There will be lane drops at the 200 South crossing in Lehi for crossing upgrade work all week. There will be truck traffic and a lane closure on 900 North in Lehi. Work continues this week on the step walls and scaffolding on the Garden Drive side of the pedestrian tunnel. At the Park and Ride Lot, conduit and curb and gutter work and rock installation at the detention pond continues. Crews will de-stress the track between 100 East and 1500 South in American Fork and hydroseed along the corridor between 5200 North in Vineyard and University Parkway in Orem. Fiber installation will take place in Orem between Geneva Road and 400 South and 800 South and University Parkway. There will be truck traffic at 1600 North in Vineyard. Between University Parkway in Orem and 2000 North in Provo crews will be hydroseeding and from University Parkway and 2800 West in Provo crews will be installing fiber. Crews will be installing signal cable in Provo at 2000 North, 2800 West, 1680 North and 820 North. Crews will surface, line and dress the track between 600 West and 900 South and will also set two signal houses in the same area. Crews will be installing a stem wall cap at the Provo Station.